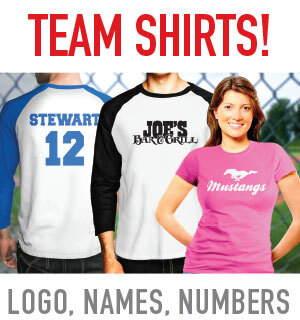 Looking for a place to get your team jerseys or t-shirts printed? We can help! All you need to do is choose your desired shirt or jersey product on our online apparel store, You can then add your team logo, you can also choose to add individual names and/or numbers to the front and/or back of the shirt. There are a variety of font styles to choose from. All of our names and numbers are cut from durable vinyl and heat press fused to the fabric. We try to make ordering names and numbers an easy process for you. 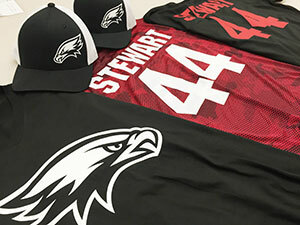 Tower Media is a one-stop solution for all your apparel needs. We can design your team logo and produce your shirts, jersey and hats all under one roof. We're here to make it easy on you! Go directly to our online apparel store by clicking here. Minimum team order - 12 pieces.